AIR-SHIELD TMP is a water-based air/liquid moisture barrier that cures to form a tough, seamless, elastomeric membrane. AIR-SHIELD TMP exhibits excellent resistance to air leakage. When properly applied as a drainage plane, AIR-SHIELD TMP prohibits liquid water intrusion into the substrate. AIR-SHIELD TMP has been specifically formulated to act as an air and liquid moisture barrier, allowing vapor to pass through it. It may be applied to most common surfaces and integrated into various wall systems. AIR-SHIELD TMP is suitable for both new construction and retrofit applications. High permeability – allows the transmission of moisture vapor through porous building materials. UV resistant – can be left exposed up to six months. Coverage dependent on substrate type, weather, and application conditions. Complies with National EPA VOC Emission Standard for Architectural Coatings, CARB, LADCO, and OTC Phase I and II VOC regulations. AIR-SHIELD TMP may be used in NFPA 285 complying wall assemblies. Contact W. R. MEADOWS for further information. Surface Preparation … All surfaces must be clean (free of all coatings and curing compounds), free of frost, structurally sound, and relatively smooth. Prepare substrate per manufacturer’s instruction prior to membrane application. Exterior Sheathing Panels … Exterior sheathing panels are to be installed and fastened per manufacturer’s recommendation. For detailed application information, see INSTALLATION INSTRUCTIONS: JOINT TREATMENT OF EXTERIOR SHEATHING PANELS WHEN USING AIR-SHIELD TMP. For joint treatment in plywood and OSB sheathing, please see PLYWOOD SHEATHING JOINT DETAIL INSTALLATION GUIDELINES. Rough Openings … Refer to AIR-SHIELD ROUGH OPENING INSTALLATION GUIDELINES for recommendations. Concrete Masonry Units … Before applying AIR-SHIELD TMP to CMU surfaces, patch all cracks, protrusions, small voids, offsets, details, irregularities, and small deformities with MEADOW-PATCH® 5 or MEADOW-PATCH 20 at least two hours before application. All mortar joints should be full and struck flush with the face of the CMU. Roller … AIR-SHIELD TMP can be applied directly from the container; a ¾” (19.1 mm) nap roller is recommended. 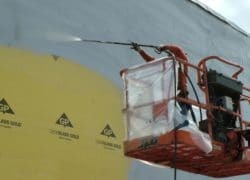 Apply AIR-SHIELD TMP on a vertical surface to achieve a final film thickness of 10 mils wet (6 mils dry). NOTE: While the proper film thickness may be achieved with a single coat, multiple coats may be necessary if the material slumps due to temperature and/or substrate conditions. Allow each previous coat to dry (approximately one hour) prior to applying the next coat. Sprayer … AIR-SHIELD TMP should be stored and maintained at a temperature of 40˚ F (4.4° C) or higher throughout the entire spray application. The product will become thick and difficult to spray at temperatures below 60˚ F (15.6° C). Note: Use of Graco HydraMax 350 or Graco GH833 is recommended for optimum performance. A Graco heavy duty texture gun with either a 0.051″ (Graco GHD 551), 0.035″ (Graco GHD 535), or 0.037″ (Graco GHD 537) spray tip is recommended. If cratering occurs, the GHD 535 or 537 is recommended for a smoother finish. Spray AIR-SHIELD TMP on a vertical surface to achieve a final film thickness of 10 mils wet (6 mils dry). NOTE: While the proper film thickness may be achieved with a single coat, multiple coats may be necessary if the material slumps due to temperature and/or substrate conditions. Allow each previous coat to dry (approximately one hour) prior to applying the next coat. Porous substrates, masonry blocks, etc., may require multiple coats to achieve recommended film thickness. Cleanup … Material should not be left in the pump, lines, or gun when finished spraying. After spraying, flush water through the system until pump and hose are clear (approximately five gallons). Aromatic solvents, such as xylene or toluene (approximately two gallons), can be used for final flushing after water is flushed through the pump and lines. Water should be flushed through the machine to remove any solvent prior to spraying of AIR-SHIELD TMP. DO NOT FREEZE. Keep containers tightly sealed. Do not apply AIR-SHIELD TMP if rainfall is forecast or imminent within 12 hours of application. Direct contact may result in mild irritation to the skin and eyes. Should adverse effects occur, remove subject from area immediately. If irritation occurs and persists, move victim from exposure source and treat symptomatically. Flush affected areas with mild soap and water. Refer to Safety Data Sheet for complete health and safety information.